The next time you visit Steinhatchee, be sure to take a look at the latest addition to the marina/motel/restaurant scene there. The Good Times Motel and Marina has opened in the same location as the old Gulfstream Marina, on the Jena side of the river. The facility offers 25 motel rooms (some recently remodeled! 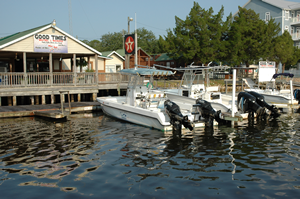 ), dockage, fuel, bait and tackle, as well as the Who Dat Bar & Grille. The motel units include boat slips, cable TV and wi-fi. The main gathering place at Good Times is no doubt the Who Dat Bar and Grille. Open 7 days for lunch, dinner and late night snacks (including beer and wine), the screened-in facility has a simple menu that includes local seafood, burgers and daily specials. Good people, Good food, Good Price….. Good Times! Traveled with the fam in October 2012, we had a blast. The cabins were very clean and roomy. The staff was very welcoming, although we were from out of town! It was as if we’d known the forever. We will definately be going back!